Just after SA’s credit rating was cut to junk status by ratings agency S&P Global, investor confidence in the country’s renewable energy sector is also on the decline. This is according to Fieldstone Africa, an independent investment bank and financial service provider in energy and infrastructure in Africa, which yesterday released its renewables index for 2017. The Fieldstone Africa Renewables Index (FARI) ranks national markets in terms of current suitability to invest (time and capital) to achieve successful renewable projects. In the previous Fieldstone Africa Renewables Index, released in October 2016, Morocco was rated the top country in Africa, followed by Uganda, with Egypt holding third place. In the latest index, Morocco still leads due to its pioneering efforts in renewable base load in Africa resulting from its commitment to concentrated solar power, says Fieldstone. Uganda’s steady progress towards achieving its plan for 1 500MW of renewable generation by 2020 saw it retain its second place in the ranking. However, Zambia pipped Egypt to third place due to its solar and hydro initiatives, underpinned by a transparent regulatory and approval regime. Egypt’s aspiration to further develop its renewable energy programme has suffered from recent currency deregulation, leading to an exodus of international investors. “The signals for renewables in Africa continue to remain positive as FARI shows. Initiatives on the continent seem more credible than earlier efforts, and there is certainly a variety – from large-scale, systemic programmes, to incremental build-up based on long-term goals,” says Jason Harlan, CEO of Fieldstone Africa. According to Fieldstone, SA, by far the country with the most potential, is still stuck in a category of its own, called “Waking Giant”. At the time FARI was introduced, Fieldstone says SA was the leading country on the continent in terms of its renewable energy programme. The country’s reputation and position on the index began to slip due to a refusal by the country’s energy utility, Eskom, to sign power purchasing agreements with several independent power producers (IPPs). Power purchase agreements (PPAs) won by IPPs in rounds 4 and 4.5 of the government’s auction process, the Renewable Energy Independent Power Produce Procurement Programme (REIPPPP), have remained unsigned for several months, seriously denting investor confidence in what was internally recognised as a highly successful programme, Fieldstone notes. This has changed somewhat over the past two months, with president Jacob Zuma announcing in his State of the Nation Address that PPAs will be signed. However, Eskom is now trying to play old coal plants to be decommissioned against additional renewables and threatening to call in the government guarantee provisions for existing IPPs. These issues aside, Fieldstone believes SA’s potential remains high. It notes the country could rocket back to the top of the index, based on the country’s Independent Resource Plan as it currently stands, which calls for the addition of 1 000MW of renewable energy a year for several years. Fieldstone points out that one positive development is some small IPPs have been fast-tracked and the long-outstanding Round 4 bids seem likely to be given the go-ahead. Meanwhile, JCRA, a financial risk consultancy firm, also released a paper in partnership with the Centre for Economic and Business Research (Cebr) looking at the Eskom dilemma and its cost to the South African economy. The consultancy firm says by claiming solar photovoltaic and wind-generated power are too expensive and refusing to sign PPAs, Eskom effectively crippled the momentum of an industry that generated high foreign investment and put SA at the forefront of renewable energy uptake. 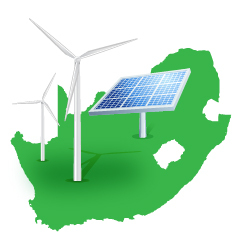 “South Africa has favourable solar and wind resources, with few land constraints, and as the per-unit costs of various renewable energy types continue to fall, Eskom’s choice to delay the uptake of renewable energy makes little economic sense,” says JCRA director Lionel Kruger. Investment in infrastructure returns large benefits, JCRA notes, pointing out that in the UK, Cebr found every £1 spent on infrastructure boosts GDP by £1.30 given various multiplier effects to boost economic activity through key supply chains such as construction and manufacturing. The cost of cancelling or delaying infrastructure projects also comes at a considerable cost, it adds. In SA, the REIPPPP attracted R196 billion investment from 2011 to 2016 and aimed to attract another R550 billion by 2020, Cebr notes. Subject to the same multiplier observed in the UK, these investments until 2020 would return around £715 billion in SA; however, this will be significantly reduced if progress is delayed, it points out.